I met up with a couple of good friends (and their kids) for an afternoon play and picnic by the river. Warm sunshine, stunning weather and a river bank at low tide… always a winning combination when trying to entertain kids on the weekend. We (the adults) sat at the cafe, enjoying coffee and cake, while the kids played a few metres away from us, on the calm beach, wading through ankle deep water, climbing over rocks and looking for treasure. Oh my, it was so relaxing. I soaked up the moment to appreciate how good we have it. Life is so easy and so rich… we are enormously blessed. 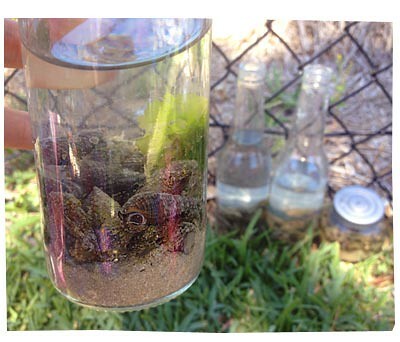 I noticed that some kids found a couple of empty glass bottles. I thought… if one of the kids dropped the bottle on the rocks, it might create a dangerous situation for all the kids, so I was going to walk over to instruct them to put the bottles in the bin. But I realised that ALL the kids had teamed up and started to collect little shells with slugs and crabs inside them. 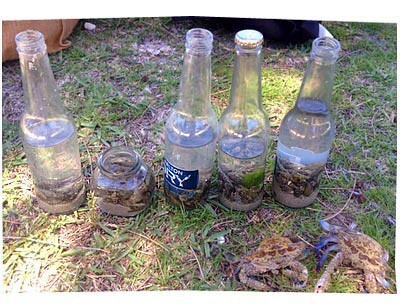 They created little “ecosystems” in the bottles… and when they were done, they ALL walked over proudly to show us adults. It was so fascinating and clever. They lined up the bottles, ready to take them home – but at that point we had to gently tell them to put all the creatures back into the water! The kids were very grumpy about that. They were not happy. Arguments and tantrums were about to begin. In the end, I insisted that I would take photos of them and put them up on my website haha! So here you go kids! A bit late, but just as Aunty Karen promised!